Mothers. We all have them. And most of them have sacrificed the entire rest of their lives to make sure that we are well fed, have clothes on our backs, and are pointed towards a bright future. However, that doesn't necessarily mean that this is the end of their careers and dreams. One may wonder just exactly how it is possible to balance the heavy needs of raising a newborn infant and thrive in the workplace. Well, Yoko Shimada, mother of 2 beautiful children and mother of maternity and nursing fashion line Mitera has just the answers. Having been immersed in the world of public health in a plethora of countries for the greater part of her career life, the fashion industry was and is the last place that one would expect Yoko to enter and thrive in, including Yoko herself. Yoko, with 15 plus years of experience in helping start and implement global health programs across the world, not only realized the lack of suitable clothing options to raise a baby while holding down and thriving at work, but also took the initiative to create one. After having her second child in 2013, Yoko started to bring the idea of Mitera to life. It all began when she actually had a dress made to accommodate her breastfeeding practices while at work. With the need to pump for her daughter at her office with a notable absence of a proper facility to do so, Yoko knew that it was time for a change. With society constantly placing unspoken pressures and expectations on mothers to breastfeed in order to raise their babies in the healthiest manner, the first months and even year, postpartum proves to be a difficult stage. Creating Mitera was a way for Yoko to take a stand against these unpractical circumstances that new mothers are faced with in their personal and professional lives. The dresses and apparel designed by Mitera are created with these struggles in mind. For example, these chic, stylish, and practical articles of clothing provide easy yet discreet access for feeding or pumping. With both the concerns of the mother and baby in mind, Mitera's goal is not only to help smooth women’s transition into motherhood but also to honor the process of creating and bringing life into this world and celebrate the woman, the nurturer - the unique, beautiful, determined, multifaceted woman who gives all she has, while still remaining who she is. 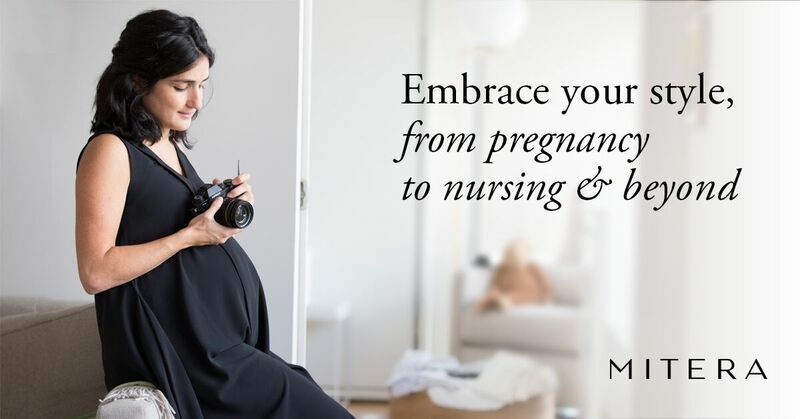 While undergoing the journey of starting and growing her fashion company, Yoko has remained focused on lifting the women up as they embark on this major transition into motherhood and helping, in her own little way, to shatter the notion that pregnancy and becoming a mother is akin to taking a career break, a set-back, a penalty, or a weakness. There are many successful women out there, who, when they become moms, have a bit of an identity crisis because it seems like they can’t continue their own paths, like they have to give themselves up for the baby. It was no different for Yoko. Through Mitera, she wants to help give these women - working moms and stay-at-home moms alike their strength and self-confidence back, to feel even more connected to their bodies and self and to be empowered with this new gift of motherhood. Mitera celebrates and supports women all around the world throughout their motherhood journeys and as they become better versions of themselves through the incredible experience of motherhood.